Ladybird larva. 7spot? Doing what it should. Observation - Ladybird larva. 7spot? Doing what it should. - UK and Ireland. Description: Black, about 5-8mm long.Knobbly, not spiny, to look at.2 pairs of coloured markings, apparently should have 4 if larva of 7spot although can find nothing similar.Eating aphid for lunch. 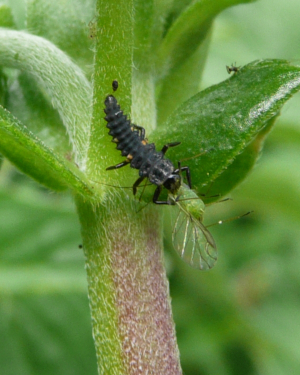 Black, about 5-8mm long.Knobbly, not spiny, to look at.2 pairs of coloured markings, apparently should have 4 if larva of 7spot although can find nothing similar.Eating aphid for lunch.